Luxury you can actually afford. Should you buy the NZXT H500i? 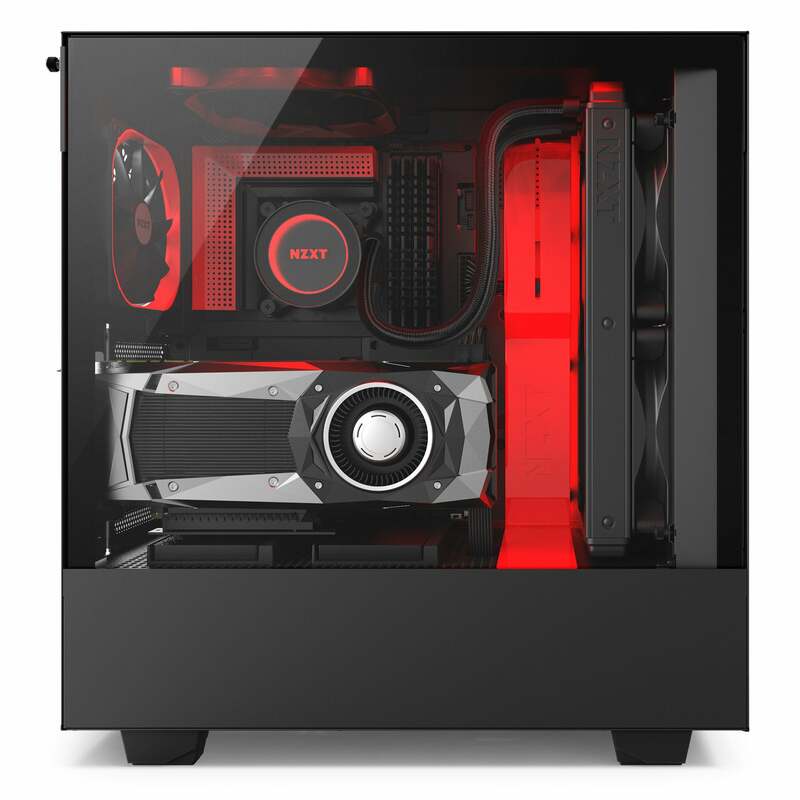 NZXT’s highly regarded H700i and H400i cases shook up the status quo when they debuted in late 2017 by blending the crisp, unpretentious look of the company’s popular S340 and S340 Elite with an integrated Smart Device that taps the company’s CAM software to manage your PC’s lighting and fans. Now it’s the mainstream’s turn. 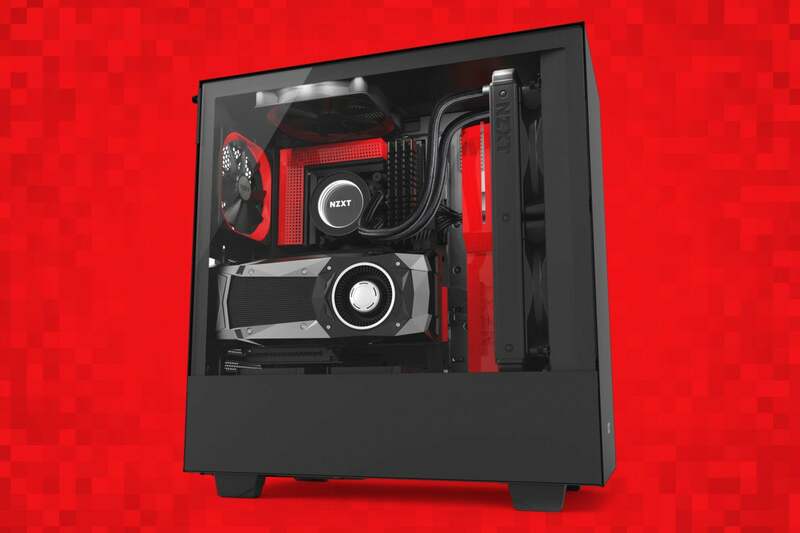 On Tuesday, NZXT has expanded the H-series with the launch of the $70 NZXT H500 and $100 NZXT H500i, two new cases that deliver the same clean design as their luxurious predecessors, but at a price more people can afford. With an integrated fan and lighting controller, two customizable RGB LED strips, a tempered glass panel, and cable management tools galore, the NZXT H500i offers a slew of premium features for a case that costs less than $100. And if you don’t need fancy lights or NZXT’s Smart Device, the H500 delivers the same strong core design as its sibling for $30 less. Both cases will be available to preorder in the U.S. Tuesday, with an expected ship date in early June. NZXT sent us an H500i to test ahead of the announcement. Let’s build it out! 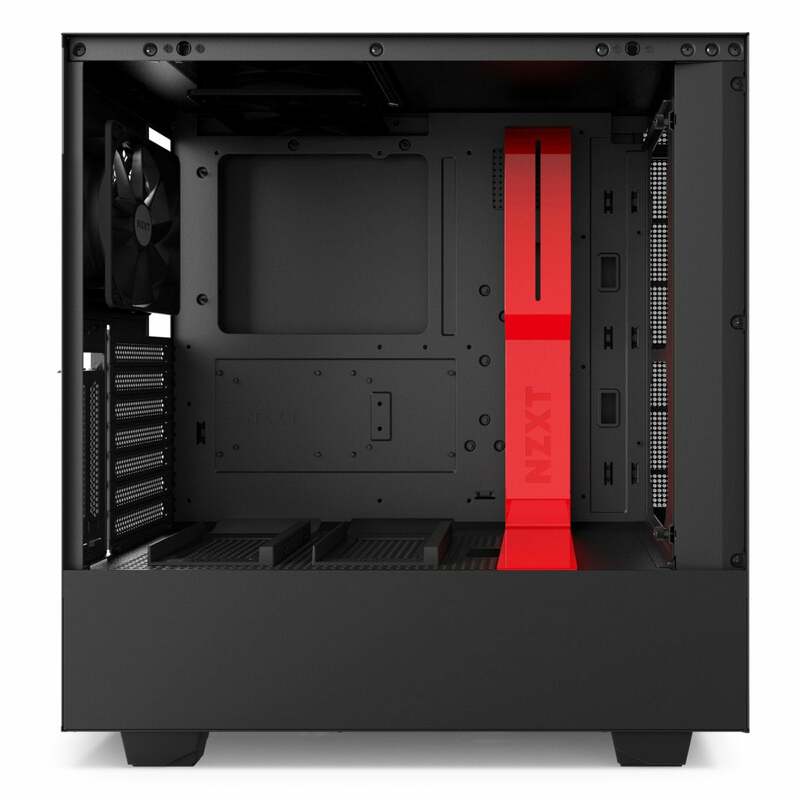 The NZXT H500i fits full ATX motherboards, but it’s still fairly compact for a mid-tower, measuring in at 210mm (8.26 inches) wide, 460mm (18.11 inches) tall, and 428mm (16.85 inches) long. (Installing an ATX motherboard required removal of the top fan first, in fact.) It’s also full of thoughtful touches typically found in pricier cases. Many cases hit sub-$100 price points by swapping out premium materials for plastic enclosures and acrylic side panels, for example. Not the H500i. 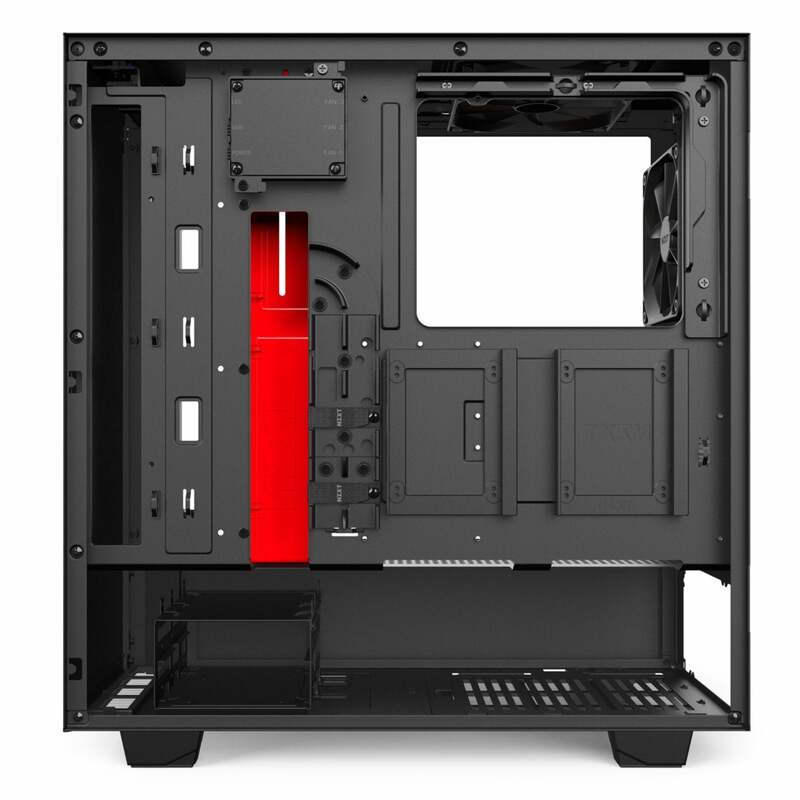 NZXT composed the entire case from steel, except for a tempered-glass side panel that shows off your PC’s internals. The design of that panel is one of the best we’ve seen, and superior to the H700i’s. Removing the tempered glass side panel is wonderfully simple. Most tempered-glass panels, even in high-end cases, need to be pressed against the case and secured with screws in the four corners. Holding a large, terrifyingly fragile TG panel with one hand while trying to align it and screw it in with your other hand can shave years off your life (and leave the glass smeared with palmprints). The H500i’s panel rests atop the full-length power supply shroud instead, sitting flush with the steel elements of the case. Even better, it’s secured by a small metal tab that wraps around to the back of the case and locks in via a single thumbscrew. Installing or removing the panel is refreshingly fast and easy. The clean design extends to the rest of the exterior. As mentioned, the power supply shroud stretches the full length of the case, hiding your hard drives as well. The top, front, and side panels feature clean, stark metal, broken up only by the power button, a pair of USB 3.1 ports, and audio/mic jacks on the top lip of the case. NZXT’s reviewers guide says the goal of the H-series is to “create a canvas for builders to use to express their individual creativity,” and it shows (though an extra pair of USB ports would be welcome, too). 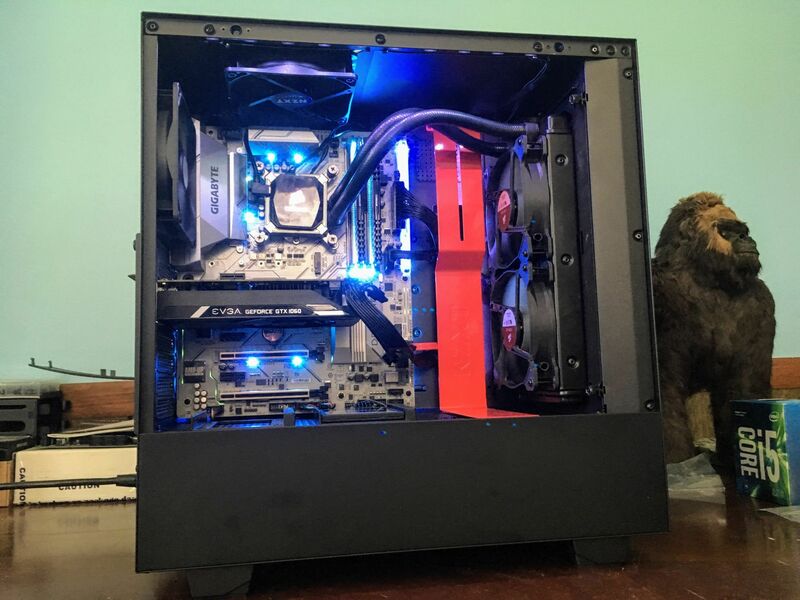 There isn’t a single logo or any other ostentatious branding on the outside of the case, though “NZXT” is subtly emblazoned on an interior feature. 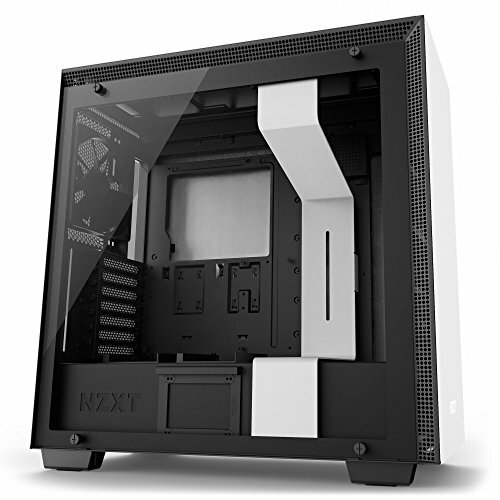 NZXT offers the H500i in matte white, matte black, matte black with red accents, and matte black with blue accents. There isn’t much ventilation, though the case didn’t overheat our test build. A narrow ventilation strip is cut into the front edge of the steel side panel to provide airflow to front intake fans. The $200 H700i included a matching line of ventilation across the top edge of the panel, but that top strip is missing from the smaller H500i. You’ll also find ventilation for up to a 140mm fan on the top and rear of the case, and several cutouts to expel air underneath the power supply. Good news, nitpicky builders: The NZXT H500i is just as clean inside as it is outside. 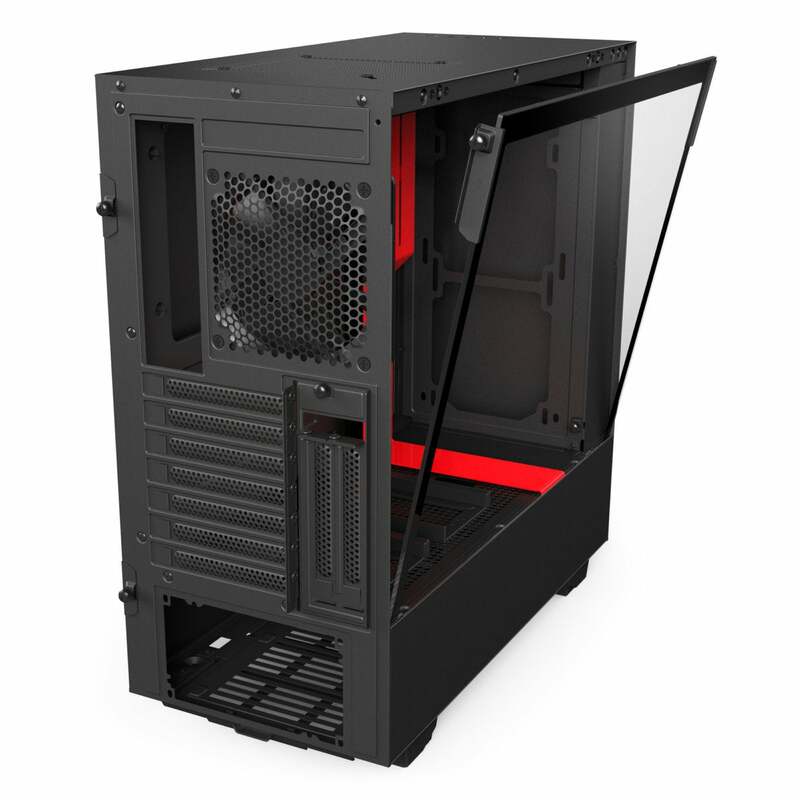 The case ships with two of NZXT’s Aer F120 fans preinstalled in the top and rear mounts (compared to four fans with the $200 H700i). The front panel has room for up to two 140mm fans or a 280mm radiator, mounted on a removeable, slide-out radiator bracket that makes installation a breeze. That’s a nice touch rarely found in budget cases. An option to install a 240mm radiator up top would’ve been nice too, but the case is so compact that doing so would’ve bumped into your RAM and other hardware. The vertical mounting bracket in the H500i lets you show off your graphics card if you have a separate riser card. A look at the NZXT H500i’s cable management bar and removeable front radiator braket. 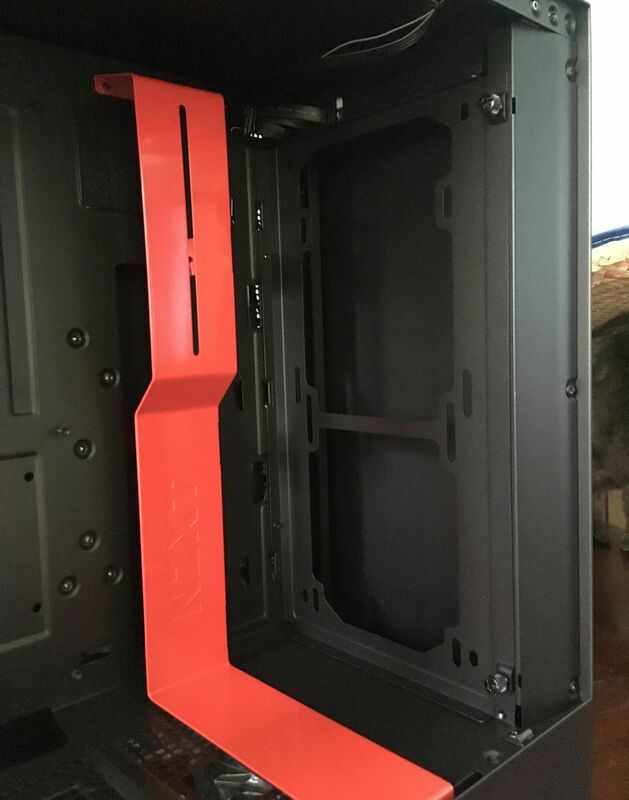 The H500i also includes NZXT’s iconic cable management bar, a strip that covers the cable routing hole next to the motherboard to keep everything looking nice and tidy. It’s a wonderful inclusion that can help elevate the looks of your rig to the next level without much effort on your end. I hope to see something similar in more cases going forward. The lack of rubber grommets on the motherboard cutout may irk some, but the edges aren’t sharp, and the cable management bar’s inclusion cleans up the case’s look anyway. The rear of the NZXT H500i’s motherboard tray packs cable routing tools galore. Excess cabling can be tucked behind the full-length power supply shroud, too. That shroud earns one of our few gripes, too. While I appreciate it’s there, it can’t be removed, and you need to slide the power supply in via a cut-out below the backside motherboard tray. If you’re using a modular power supply, be sure to wire it up before sliding it in, because between the permanent nature of the shroud and the hard drive rack near the PSU, it’s damned near impossible to work your fingers into the space to add more power cables in the future. The top of that shroud is ventilated across its entire length. The NZXT H500’s pair of SSD trays clip into them using a clever spring-loaded mechanism that pops the trays free if you push in a bar on the side. It’s great. I love how the design lets you show off your SSDs just like the rest of your gear, though I’d have preferred it if the SSD trays secured the drives using a toolless design similar to what you find in the Corsair 570X. That case costs a lot more, though. If you don’t like staring at your SSDs or the thought of your graphics card blowing directly down on them, the trays can also be popped into the usual location behind the motherboard. One thing you won’t find in the NZXT H500i: An optical drive bay. But that’s common in gaming cases these days, as many (most?) manufacturers focus instead on optimizing airflow from the front intake. 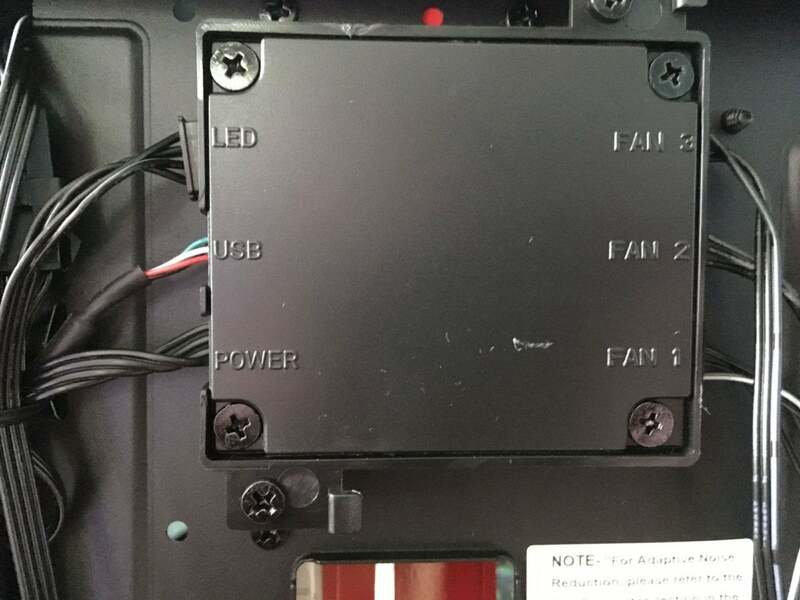 The NZXT Smart Device hides on the rear of the motherboard tray. Beyond the vertical GPU mount and the removable front radiator bracket, the difference between the $70 NZXT H500 and $100 NZXT H500i is the “I” that gives the latter its name. The H500i includes an integrated Smart Device that gives the case intelligence by acting as sort of an all-in-one version of NZXT’s Hue+ RGB lighting and Grid+ V3 fan controllers. The NZXT H500 comes with two Aer F120 fans and two customizable RGB light strips (one behind the cable management bar, and another at the top of the case) preinstalled. All are wired into the Smart Device, which also includes a fan splitter that can support up to three additional fans, and a noise detection module that measures the sound levels inside your case. Downloading the NZXT Cam software gives you the ability to control the Smart Device (as well as other goodies like component monitoring, GPU overclocking, and an FPS overlay in games). The lighting tab lets you tweak the coloring of the two RGB light strips, as well as apply visual effects like breathing or pulse. Physical controls on the outside of the case are solely lacking. But the truly interesting stuff is in the Adaptive Noise Reduction tab, which can only be accessed if you own an H-series case with a Smart Device and register an NZXT account. Adaptive Noise Reduction debuted in the previous H-series cases (like the H700i) but has been improved in newer software releases. ANR uses the noise detection module inside the Smart Device to measure ambient noise as the software cycles your PC from idle to load. Before you can use ANR, you need to calibrate the feature in a process that took 23 minutes on my test system. Adaptive Noise Reduction will then use machine learning and its database of thousands of PC configurations in other H-series cases to create a custom fan profile for you. Adaptive Noise Reduction’s before and after metrics in our test build. In a conversation with NZXT’s Jim Carlton, he stressed that the feature was designed with noise reduction in mind—hence the name. Achieving lower noise levels could result in slightly higher component temperatures if it requires the Smart Device to reduce fan speeds. In the case of my test PC, the Adaptive Noise Reduction calibration actually resulted in a 0.5 decibel noise increase, according to the Cam software, but idle temperatures reduced by 5 degrees Celsius on the CPU and a full 10 degrees on the GPU, as you can see above. I’ll take it! I didn’t see any reduction in temperature while running the Deus Ex: Mankind Divided benchmark, and some enthusiasts might not want a server in the cloud mucking with their system thermals and noise levels. Others might prefer less heat in exchange for more sound. Fortunately, Adaptive Noise Reduction is an optional feature (albeit a flagship one for the H500i), and the optional Cam software also includes custom fan profile options and preconfigured profiles for more silence or more performance. The NZXT H500i packs premium features, premium materials, and thoughtful design typically found in much more expensive cases, but for only $100. The few drawbacks I discovered were more like little quibbles than actual flaws. Building in the H500i was an easy experience comparable to building in rival cases with a big, empty interior, and it was made even simpler (and far cleaner) thanks to NZXT’s abundant cable routing options. 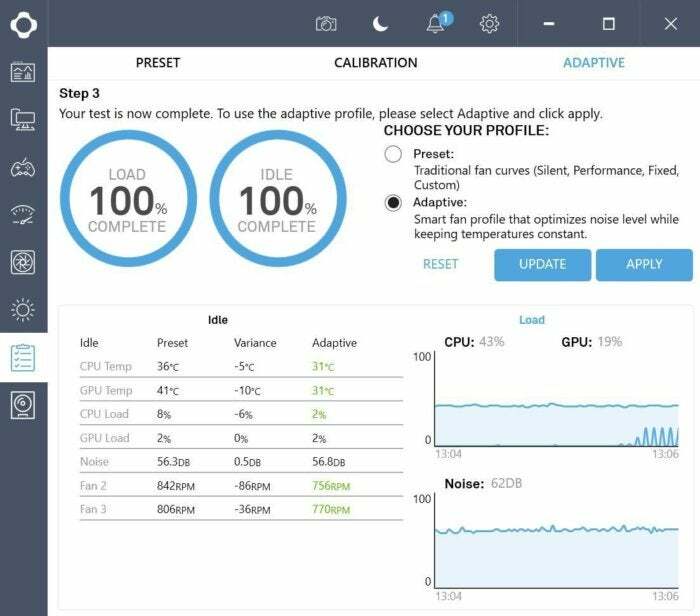 The Smart Device made my test system run much cooler at idle with barely any effort on my end—a compelling feature for PC builders who aren’t die-hard tweaking enthusiasts. We haven’t reviewed many cases here at PCWorld, but the H500i stands head and shoulders above the other cases I’ve ever touched for $100 or less. If you aren’t interested in RGB lights, vertical GPU mounts, and NZXT’s Smart Device, the NZXT H500 also seems like a great option for $70. You can enable RGB and fan control via other means if you want, but still get NZXT’s superb build quality and top-notch cable management options. NZXT’s H-series continues to churn out excellent cases. The NZXT H500i blends clean design and outstanding cable management with a boatload of premium features typically found in more expensive cases. It's one of the best cases under $100 that we've seen despite a few minor flaws. 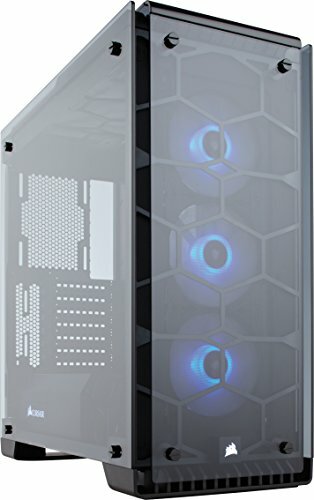 Awkward to add PSU cables or HDDs after installation.